Some of the large buildings in the courtyards may have been workshops and there were certainly stable buildings shown in the east courtyard that was accessed from Absalonsgade - two smaller stables with four stalls in one and 11 stalls in the other but there was also one long range which seems to have had a central passage way with 15 stalls on each side and a large yard to the front so there were, possibly, 45 horses in all kept in the courtyard with all the noise, smell, and manure that would imply. The stable with four stalls appears to have two carriage or cart sheds adjoining so may have been used by a carrier or delivery man. Riding horses and carriage horses might well have been kept in some courtyards. One advantage, though possibly on balance not a great advantage was that there would have just been hay lofts above the stalls so the buildings would not have been that high so would not have cut out much light to the buildings around. Long thin buildings shown in the narrow courtyards of the Skydebanegade buildings were presumably toilets - the plan here is at first-floor level or above as the archways from the street at ground level are not shown - so the narrow strips of building are drawn as if looking down on the roof. In the apartment buildings themselves, there are small square, until, internal rooms shown close to the secondary or back staircases and these might have been inside toilets and possibly shared between several apartments but given the date of the building which was completed y 1893 inside toilets and toilets flushed by water are not likely to be an original feature if only because the very first flush toilets in the city are said to date from 1893 and were in apartments in the much much grander street of Stockholmsgade in Østerport. By the late middle ages, Copenhagen was enclosed by high embankments with outer ditches and the city could only be entered through gateways that were closed at night. Within these defences there was a tightly packed network of streets and alleyways with small squares and market places and with open areas around the major churches. Few buildings were allowed outside the ramparts so, as the population increased, many gardens and courtyards were built over and then buildings were raised in height or rebuilt as taller and more substantial or more fashionable houses. With a number of devastating and extensive fires in the city and also with commercial pressure to improve buildings, to create shops and administrative buildings, few early houses survive. There are some timber-framed houses dating from the 16th or 17th centuries in the north part of the old city and in Christianshavn. These are relatively low and narrow but deep so they have large high-pitched roofs either running back from the street or more often with the ridge parallel to the street but with additional front gables or high gabled dormers to increase head height within the attic space. The timber framing generally forms square panels and the building are usually rendered and most painted traditional colours - usually deep ochre or a dark iron oxide red. Some of the framed houses show clear evidence that they were raised in height with new floors added and new roofs built or the old roof ridge was kept but the outer eaves raised to form a shallower pitch of roof so that a series of dormers could be amalgamated to form a new complete top floor. There are large merchants houses along Gammel Strand, along the quays of Nyhavn and in Christianshavn but it seems clear that as the population of the city increased then many of the older houses were crudely divided up into apartments or in some cases subdivided for single rooms for a whole family. Fine town houses for the wealthy were built on either side of the main streets through a new area, laid out in the 18th century beyond the king’s square - Kongens Nytorv, and there are substantial houses overlooking the King’s Garden but in the older part of the city, where there was new building, they are often purpose-built apartments, and to the west and north after the city defences were removed in the second half of the 19th century, almost all new buildings are apartment blocks rather than houses for single separate families however wealthy. There are some curious examples where smaller houses in a street were replaced by large apartment buildings, presumably working from opposite ends of a block by buying and amalgamating narrow plots, but somehow a narrow plot was left so there is now a small house flanked by much taller apartment buildings. Christian IV understood well that the men in his navy and in his army might be more loyal if they had reasonable accommodation and some rights to housing after they left his service. The houses in Brumleby in Østerbro, designed by the architects Michael Gottlieb Bindesbøll, were built for The Medical Association housing scheme and initially were known as Lægeforeningens Boliger. There are four rows of blocks separated by wide gardens or avenues with 240 units in the first phase begun in 1853 and completed in 1857. Between 1866 and 1872 a further 310 units were added, designed by the architect Vilhelm Klein. Common facilities included a kindergarten, bathhouse and meeting hall and the first co-operative store in Copenhagen. Designed by Vilhelm Tvede for the charity Det Classenske Fideicommis that had been established in the 18th century by an Army General and armaments manufacture Johan Frederik Classen. This terraced row of eight houses is just north of the royal palace and runs parallel to the harbour but is set back behind warehouses. There is a courtyard or garden to the front, on the side away from the harbour, separated from the street by iron railings and stone gate piers and there are very small back yards with single-storey toilet blocks - presumably for the use of servants. Dating from 1873 to 1889 and designed by Frederik Christian Bøttger, there are 480 houses in relatively short and continuous terraces along eleven streets between Øster Farimagsgade and Øster Søgade which, as its name implies, runs along the south shore of the lake Sortedams Sø. There are several streets in Copenhagen that date from the late 19th century with family homes in terraced rows that have been built following a pattern that is very common in England at the same time. That is, all the houses are directly onto the pavement without a front garden and although the plots are the same width and all the architectural features are close in style, it is clear that along the terraced row the plots were sold to individual builders who put two, three, four or sometimes more houses in a section that are identical but vary slightly from the adjoining houses along the street. There is one short terraced row near the harbour called The English Row Houses but these too differ from standard English houses in plan and form. The Nyboder housing - on the north edge of the historic city and close to Kastellet, the fortress or citadel - were houses built for the navy. The first of the houses were constructed in the early 17th century and through the 17th and 18th centuries more rows were added with a series of parallel streets with long narrow yards between the rows of houses. In the 1880s several blocks of the old Nyboder houses were demolished. New streets of apartment buildings were constructed between Borger Gade and Store Kongensgade and a new church, Sankt Pauls Kirke, was built facing a new square with new naval houses constructed along three parallel streets close to the church including Haregade, Gernersgade and Rævegade. These houses are much larger than the earlier Nyboder row houses and were subdivided into apartments. Designed by the architect Frederik Bøttger and built for The Worker’s Byuilding Association between 1892 and 1903. There are 393 houses here on the north edge of Østerbro - close to Svanmøllen railway station and just below the the suburban railway line where it curves round across the north part of the city. 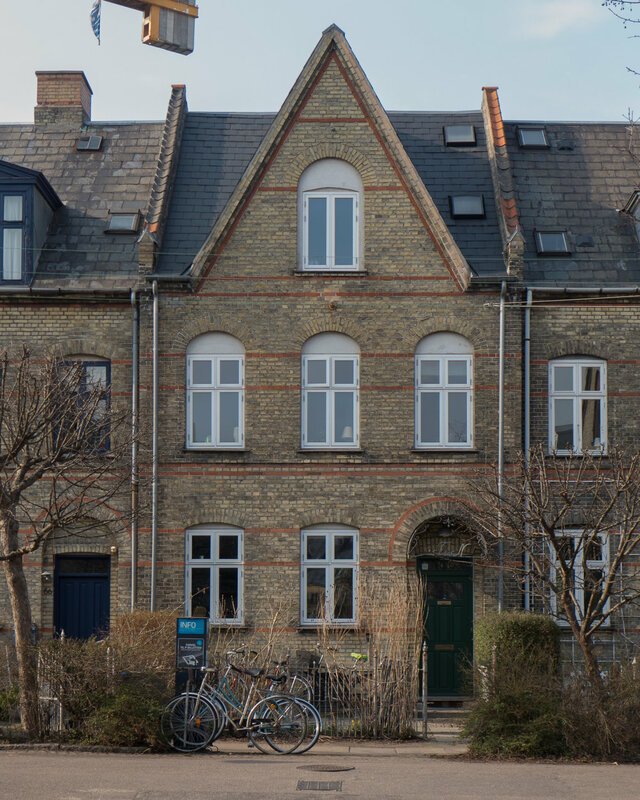 About 4 kilometres (2.5 miles) to the north west of the city on a slope that faces south east and looks down on and across Copenhagen, this was the first scheme built for KAB (Copenhagen’s Public Housing Association) that had been founded in 1920. The Bakkehusene scheme was designed by Ivar Bentsen and Thorkild Henningsen and completed in 1923. There were 171 low-rise houses in short rows running away from a large, tree lined rectangular green that rose up the slope from Hulgårdsvej. The row house was a traditional rural form found in villages and small market towns although a few survive in Copenhagen, notably in Sankt Pauls Gade - some of the earliest houses in the Nyboder area and dating from the early 17th century - and in a short row at the south end of the Frederiksholm Canal. Søndergårdspark was constructed between 1949 and 1951 for the Danish Public Housing Association. Designed by Poul Hoff and Bennet Windinge, the plan and style of the houses were a development of schemes before the war at Studiebyen in 1920-1924 and for the Bakkehusene housing scheme completed in 1923 but at Søndergårdspark there was more emphasis on a rural form of landscape with informal planting of trees and shrubs and the houses set at slight angles around a large open public space, like a village green, rather than along a street or around a formal square.